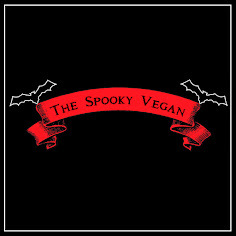 The Spooky Vegan: I Adopted a Turkey for Thanksgiving! This year I solidified a new Thanksgiving tradition for myself...adopting a turkey for the season from Farm Sanctuary! 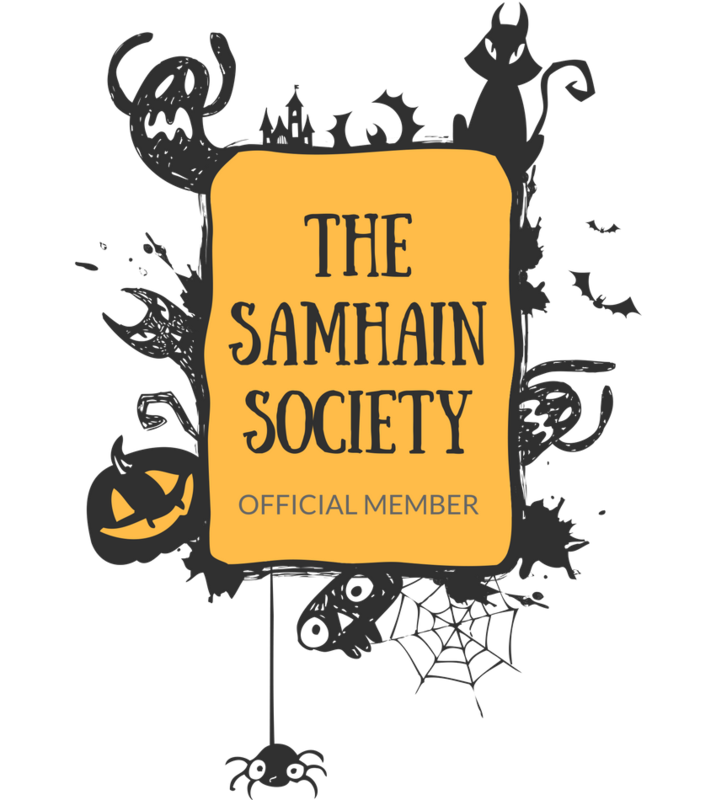 I've been meaning to do this for YEARS now, but for one reason or another (finances, running out of time, etc.) I never got a chance to donate to this very worthy cause. I'm not a big fan of Thanksgiving (or as I call it, Thankskilling, which is also the name a pretty hilarious horror movie where a badass turkey turns the tables and massacres humans! 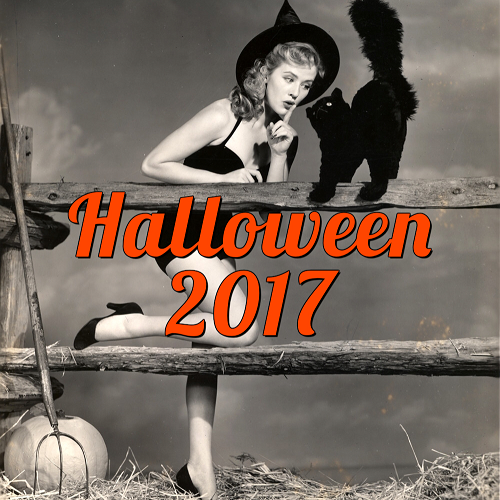 ), which seems like a silly holiday since we Americans have lost sight of what it really represents, instead treating it like a free-for-all glutton fest. And of course, it puts me in a very fowl (mwahaha...couldn't resist a poultry joke) mood to see turkey carcasses littering grocery stores. You can learn more about Thanksgiving’s toll on turkeys here. This year is different, though, since donating to Farm Sanctuary and adopting the cute Payton (seen above) has put me back in good holiday spirits! I saved a life this Thanksgiving and realized I can and do make a difference for turkeys. I plan on adopting a turkey every year from now on and joining many others in making the compassionate choice this holiday season. Adopt your turkey this Thanksgiving instead of eating one! Save a life instead of senselessly ending one! Who can resist the adorable faces of turkeys gobbling for compassion at Thanksgiving? Not Ellen DeGeneres. That’s why she’s back for the second year in a row to serve as Farm Sanctuary’s Adopt-A-Turkey Project spokesperson, inviting everyone to save, not eat, a turkey this holiday season. Says DeGeneres: "Did you know that every year between 250 and 300 million turkeys are bred for slaughter in the United States? More than 46 million for Thanksgiving alone. 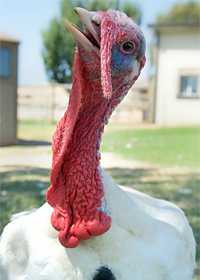 So, this Thanksgiving instead of eating a turkey, please join me in adopting one from Farm Sanctuary’s Adopt-A-Turkey Project and you can give a turkey something to be thankful for." 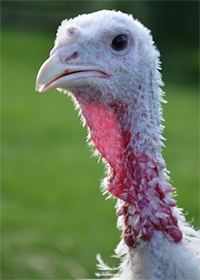 For 25 years, the Adopt-A-Turkey Project has put smiles on the faces of both carnivores and vegetarians alike, while providing support for the care of more than 1,000 rescued turkeys and inspiring people everywhere to make more compassionate choices. For a one-time donation of just $30, adopters or a recipient of their choice will receive a special Adopt-A-Turkey certificate complete with color photo of a rescued turkey who resides at one of Farm Sanctuary’s shelters and fun details about their adopted turkey. You can learn more about Thanksgiving’s toll on turkeys here. 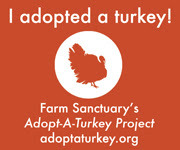 To join Ellen DeGeneres in starting a new tradition by adopting a turkey instead of eating one and to view this year’s “adoptable” turkeys, visit adoptaturkey.org or call the Turkey Adoption Hotline at 1-888-SPONSOR. 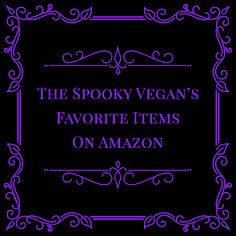 Farm Sanctuary, the nation's leading farm animal protection organization, promotes legislative, policy, and individual lifestyle changes to help farm animals. Farm Sanctuary’s shelters in New York and California provide lifelong care for nearly 1,000 rescued farm animals. For more information, please visit farmsanctuary.org. Gosh, I wish you could visit Staten Island. You would be tickled pink to see all of the wild turkeys running around. For the most part Staten Islanders have been really cool about having the birdies running around the parks and in backyards. :D I love 'em. I should take pictures! Especially when the eggs hatch!!! The babies are SO cute. Aw that sounds so cool!! Very cool that you did this! We visited the NY Farm Sanctuary years ago & just adored it. I was amazed at how soft the turkeys were. I'll have to look up that movie. It sounds like something we'd love! Turkeys are super cool. I fell in love with them after meeting a few feathered guys at the local sanctuary! Payton is the fella the husband and I adopted as well. I love his hilarious adorable face! We've done Farm Sanctuary's Adopt-a-Turkey for the past eight years, I think, and it is really my favorite part of the holiday. 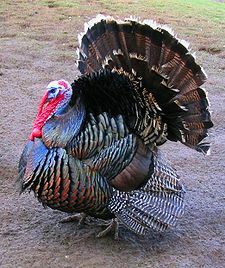 I like turkeys, I agree with Ben Franklin that the turkey should have been the official national bird of the US. I did get a tofurkey one year, and we do tend to fool around with dishes other than turkey. After all, its really all about the stuffing anyway, everybody knows that. Maybe I'll see if I can get something like a cage-free bird. 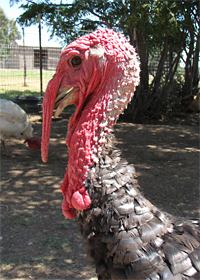 Good recommendation on the turkey sanctuary idea though. I could do it like a carbon offset, heh heh. No, that'd be even more creepy I think.